He’s the most fearsome sheriff in the West. A force to be reckoned with. The stuff of legend. The Sheriffs of Savage Wells, Sarah M. Eden’s latest entry in the “A Proper Romance” series, is another winner. The story is set in the Wyoming Territory town of Savage Wells, a town reputed to be one of the quietest towns in the territory. Savage Wells needs a new sheriff as their last sheriff decided he’d rather be a lumberjack in Oregon. In his absence, the job has been filled by Paisley Bell, who basically did the sheriff’s job for the last several months he was in town, though the former sheriff took all the credit for Paisley’s hard work. Among the candidates is Cade O’Brien, legendary lawman, who is tired of having to clean up Wild West towns and looks forward to the opportunity to sheriff quiet Savage Wells. When he first arrives sparks fly between the two as Paisley fights to be taken seriously as a candidate for sheriff. Paisley proves herself well, but the town council still decides that they need a man to be sheriff and the job goes to Cade O’Brien. Sparks continue to fly between the two as Cade settles in, Paisley finds odd jobs to support her and her declining father, and the two continue to get to know each other. When the town bank becomes a regional hub for money distribution to other towns in the region, things begin to get more interesting for the sheriff, and their relationship is complicated by the reappearance of Paisley’s former fiancé, who is the bank’s new teller. The story reaches its peak when Paisley and Cade realize that something is amiss at the bank, and Paisley receives an unexpected job offer from the federal marshal. I always enjoy Sarah Eden’s novels. Though they are billed as romance, the focus of the story isn’t necessarily on the romance part. 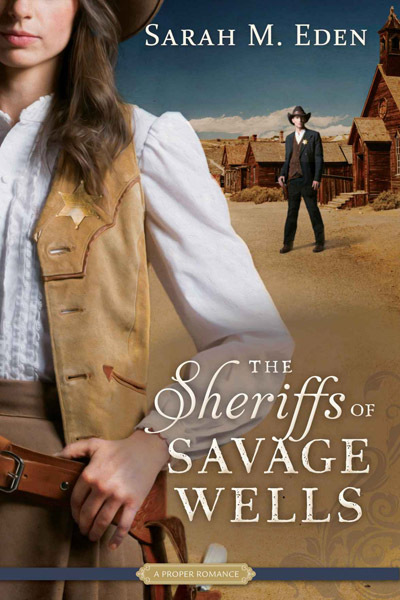 The Sheriffs of Savage Wells is no exception. The storyline stands on its own and the developing relationship between Paisley and Cade is interwoven seamlessly throughout. The characters are well-developed, 3-dimensional people, and the writing is descriptive enough to be visual and allow the reader to “see” the story. I could see The Sheriffs of Savage Wells as a Hallmark Channel movie (Are you listening, Hallmark?) with its engaging characters and enjoyable storyline. Paisley is another strong heroine, but not a perfect one. While she is well-known to the town and always ready to step up and help, she also struggles with being accepted, and we see how her struggles color her relationships. Paisley is a likeable and relatable heroine. In fact, I would love to see her featured in another book about her adventures in her new job. I think that could be a great series all by itself. I highly recommend The Sheriffs of Savage Wells as another engaging and entertaining by Sarah M. Eden You can find it in paperback, Kindle, and audio CD from Amazon .com.